Some people take a long weekend, with warm beautiful weather, and go to the beach or to a park or just lay about in the sun. Not me, and therefore by default, not DB either. We painted in the attic. Actually, we should have done this months ago when the two new windows were put in. Until the sun came out and the days got longer I had no energy or enthusiasm for this job. Now I had plenty! 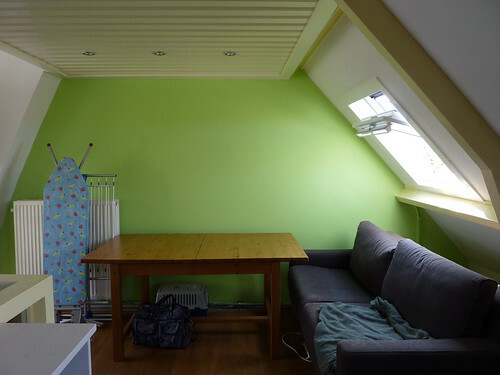 I had also wanted to paint that horrible dark green wall in the attic since we moved in almost three years ago. We ran out of time before moving day and you know how it is when you move in – once you are in lots of things you think you will do later just never get done. 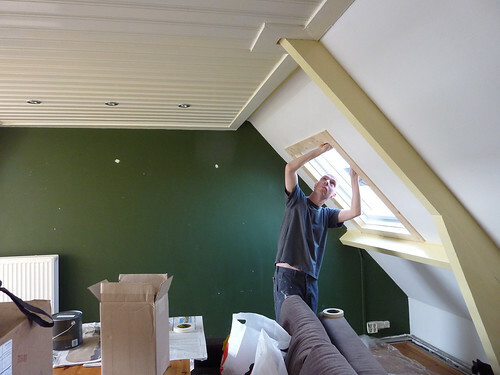 This long Easter weekend we painted the woodwork around the new windows and painted the green wall. A white wall also in the attic was painted, but I don’t have photos of that change, and it was a pretty subtle change anyway. Here are the before and after photos of the green wall and one of the windows. Doesn’t it look so much better?